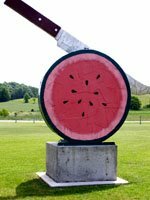 What do a unique sculpture garden in Vining (see photo), a foster home for disabled children in the Moorhead area and Alexandria’s Runestone Museum have in common? They will all get new coats of paint this year, thanks to Valspar Corporation and the Minnesota Beautiful "Picture-It-Painted" Program administered by West Central Initiative and its five sister Minnesota Initiative Foundations (MIFs). The six foundations recently honored Valspar, a Twin Cities-based manufacturer of paints and coatings, with the Valued Partner Award for a decade of helping to beautify Greater Minnesota. Valspar has provided 27,700 gallons of free paint, stain and sealant for 650 community beautification and restoration projects throughout greater Minnesota. The Valspar family of brands includes Valspar, Cabot, Goof Off, House of Kolor, plasti-cote, and QUIKRETE. "This is our only program in Greater Minnesota," said Valspar’s Gwen Leifeld, as she accepted the award at The McKnight Foundation offices in Minneapolis. "We are thrilled to have partnered with the Initiative Foundations for the past 10 years and feel we are a part of small-town Minnesota through their efforts." "Valspar's decade of generosity means there’s hardly an area in west central Minnesota that hasn’t been positively affected by the Picture It Painted program," said Nancy Straw, president of West Central Initiative. "We’re thankful for this successful collaboration and for Valspar’s ongoing commitment to our region and all of Greater Minnesota. " This year, 17 organizations from west central Minnesota received Picture-It-Painted grants, totaling 856 gallons of paint. Grant selection is based on the visual impact of the project, public benefit to the community, local volunteer participation and support, intended use of the building, and benefit to the needy. Projects that qualify include, but are not limited to, historic buildings, senior citizen or handicapped facilities, community centers, public buildings and murals. Formed in 1986 by The McKnight Foundation to serve the people of rural Minnesota, the MIFs include the Northwest Minnesota Foundation, Initiative Foundation, Northland Foundation, West Central Initiative, Southwest Initiative Foundation, and Southern Minnesota Initiative Foundation. Their unique, decade-long partnership with Valspar to implement the paint grant program was created out of Valspar’s desire for a greater philanthropic presence throughout Minnesota. The agrarian life was never so fancy! Get ready to celebrate 150 years of statehood!